1. Attach the thread and wrap back to the bend. 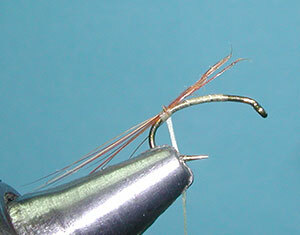 Tie in a clump of ten to twelve brown Spade hackle fibers. Keep the fibers together as a bundle as they represent the shuck of the mayfly nymph. 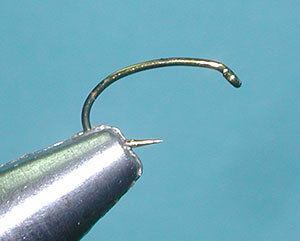 Clip the tips of the fibers so they are flush with one another and are about 1/2 hook shank long. 2. Dub a tapered abdomen from the base of the shuck to the seventy five percent point on the hook with the olive	brown superfine dubbing. 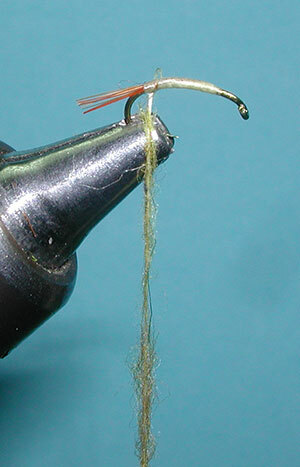 Wrap the tying thread back up onto the front of the abdomen overlapping back to the +/- 60 percent point. 3. 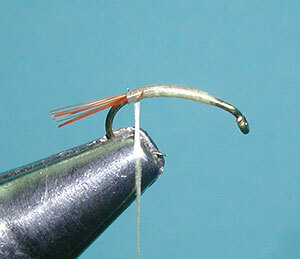 Tie in a clump of ten or twelve Blue Dun spade hackle fibers at the front of the abdomen at the sixty percent point. 4. Dub the thread with the PMD Superfine dubbing and wrap it to form a ball from the sixty percent point forward to the index point (one eye length behind the hook eye). Be sure to leave one eye length of bare shank behind the hook eye at this point as it will become important in the next step. 5. 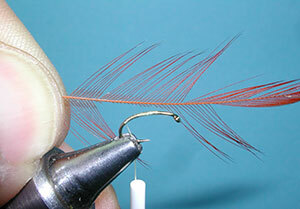 Pull the Blue Dun hackle fibers tightly forward over the thorax forming the wingcase. 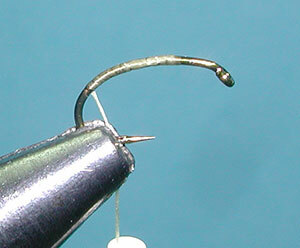 Bind them down behind the hook eye with two or three tight thread turns. 6. 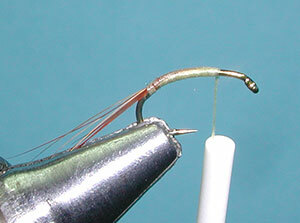 Pull half of the remaining fibers back along the far side of the hook shank and bind them down with a couple wraps. Pull the other half of the remaining fibers back along the near side and bind them down as well. Whip finish and clip the thread. 7. Clip the ends of the legs so they are equal in length to the wingcase .